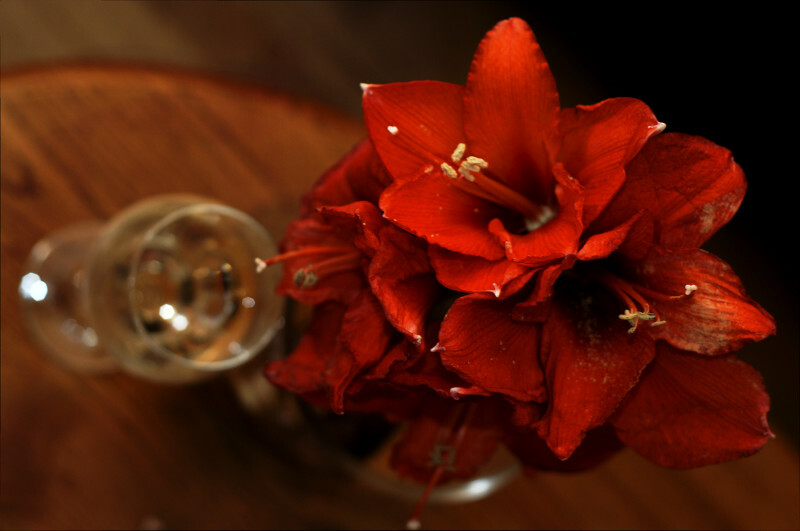 What better way to spend a wet Christmas Eve evening but with wine and amaryllis. A rather uncommon weather condition resulted in a soggy, rather than a snowy, Christmas. And while visiting some friends during the holiday season, I sat in the living room area where they were amaryllis on display. The blossoms were way to inviting to ignore and thus I decided to work on some compositions. Although I had first started by taking frontal shots, I found the composition to be a little too common and limiting. I also found the lighting to be less than flattering. So, I first started by introducing some flash into the image. The idea was to open up the dark areas with a little flash. However, once I got comfortable with the images and the level of light I was introducing into the scene, I couldn’t help moving around the scene to get a different perspective. I first started in the front, and then on the side. I tried isolating the amaryllis alone as well as isolating the wine glass alone. I tried introducing hands into the shot to help draw some interest as well. The one perspective which caught my attention however was the aerial position which I utilized in the image present in this image. It allowed a different way of visualizing the amaryllis and the glass of wine in a manner which I had never explored before. Further, it allowed me to present the items in a pleasing and interesting manner. It was not really the intention of the evening but what started with an evening visiting a friend for the Christmas evolved in a simple photo shoot which involved wine an amaryllis. And, after numerous experiments with lighting, perspective and composition resulted in the aerial scene shown in this post which to me was the most pleasing of the bunch.